A revisit to another of my favorite spots. 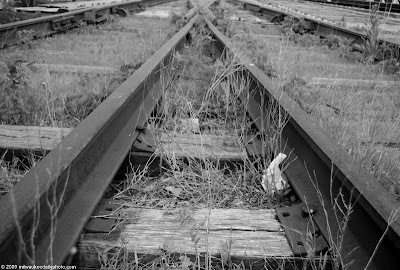 This abandoned rail is near the river in the Third Ward. A different angle can be seen here. Tomorrow is the first of the month, and time for another theme day. I was out of town today, and had a tremendous beer (Dogfish Head Raison d'Etre) that reminded me of some Belgian ales I've enjoyed. 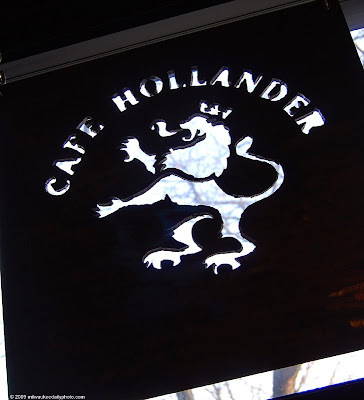 That inspired today's photo, a return trip to Cafe Hollander, where they have fine Belgians on tap and in bottles. The Pabst Visitors Center (now part of Best Place) contains a number of large murals undergoing restoration. Each one has a beer-related scene and a phrase in German related to the artwork. 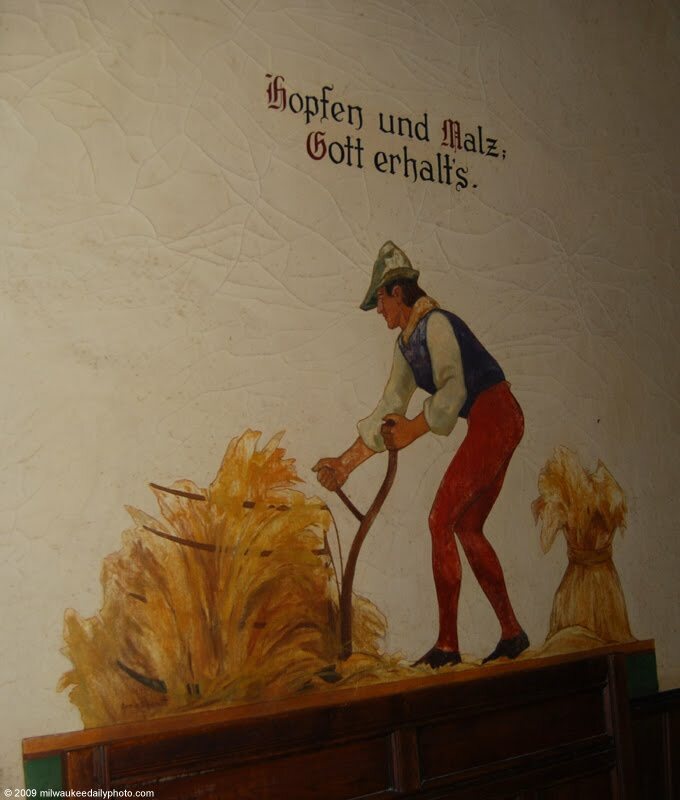 This one roughly translates to "Hops and Malt, God Provides". An apropos phrase for Thanksgiving weekend, I suppose. MillerCoors has announced the schedule for this year's holiday lights show. The show will start on Thursday, December 3rd, and run through Saturday, December 19th. 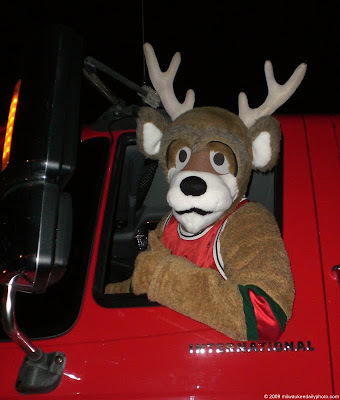 Each Thursday, Friday, and Saturday night, the special tours will run every 20 minutes from 5:00pm until 8:00pm, and begin and end at the Tour Center on State Street just west of the brewery. 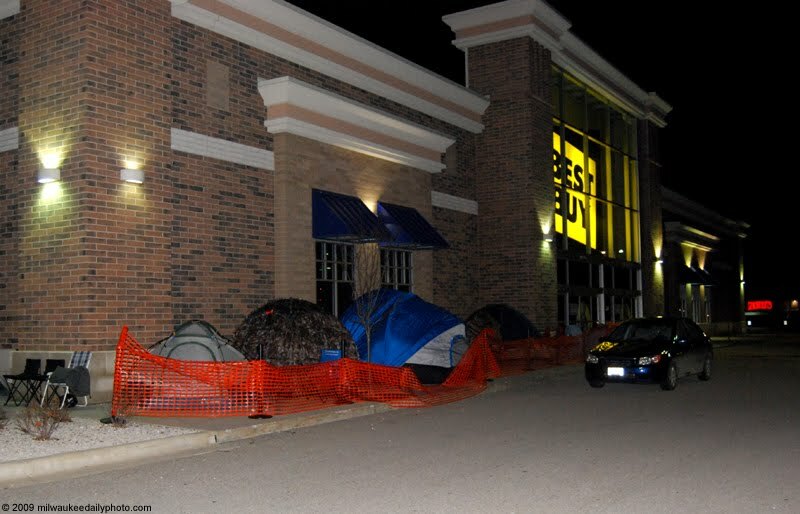 On our trip north for Thanksgiving dinner, we noticed a tent in front of this store in Menomonee Falls. On the way back home, we stopped by to check on the campers, and found that there were even more people waiting in line. 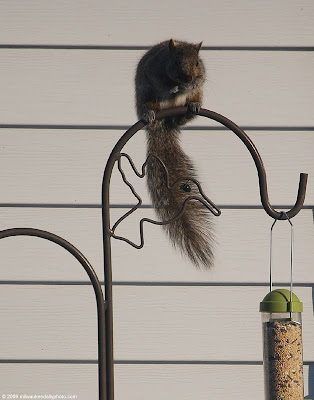 I sure hope that they get whatever they're looking for tomorrow morning, as it is quite cold and windy tonight. Congratulations and good luck to the six Brewers nominated for This Year in Baseball awards. Both Prince Fielder and Ryan Braun are up for Hitter of the Year, and Casey McGehee (pictured above with Prince) is up for Rookie of the Year. Three pitchers have also been nominated; Trevor Hoffman for Closer, Todd Coffey for Set-Up Man, and Yovani Gallardo for Performance of the Year. Gallardo won a game by almost single-handedly on April 19, when he pitched eight shutout innings and hit a home run in the seventh inning for a 1-to-nothing win over the Pittsburgh Pirates. We were at the AMC Theatre in neighboring Wauwatosa tonight to catch a free sneak preview of "The Fantastic Mr. Fox". The film was ok (I give it a C+, but it was based on a childrens' book, so I wouldn't consider myself target audience). 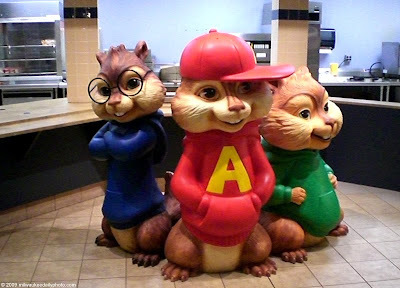 On the way out, I took a moment to snap a quick photo of these huge props for the upcoming Alvin and the Chipmunks movie. This has to be one of the most elaborate and detailed teaser displays I've ever seen, considering that most are cardboard cut-outs of some type. 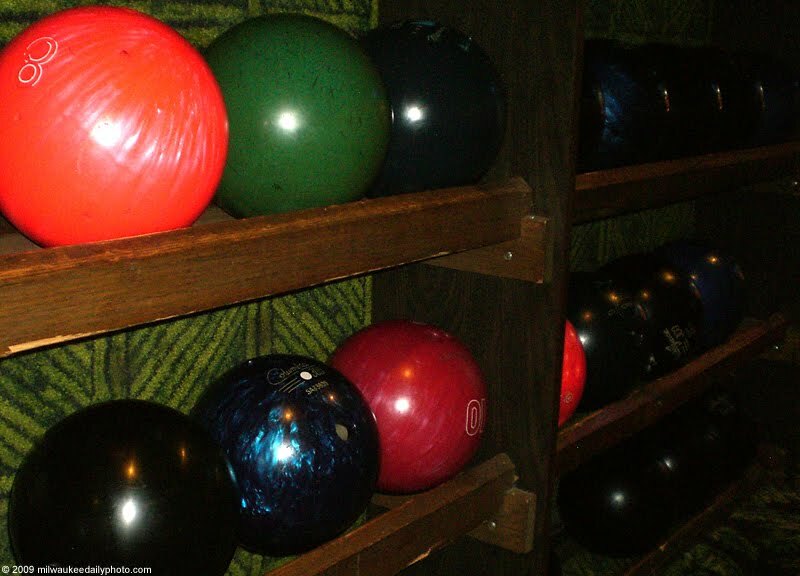 Another Monday night, another trip to the bowling alley. Tonight was our league's Thanksgiving Turkey Sweeper, and I was lucky enough to win a turkey to take home and put in the freezer. 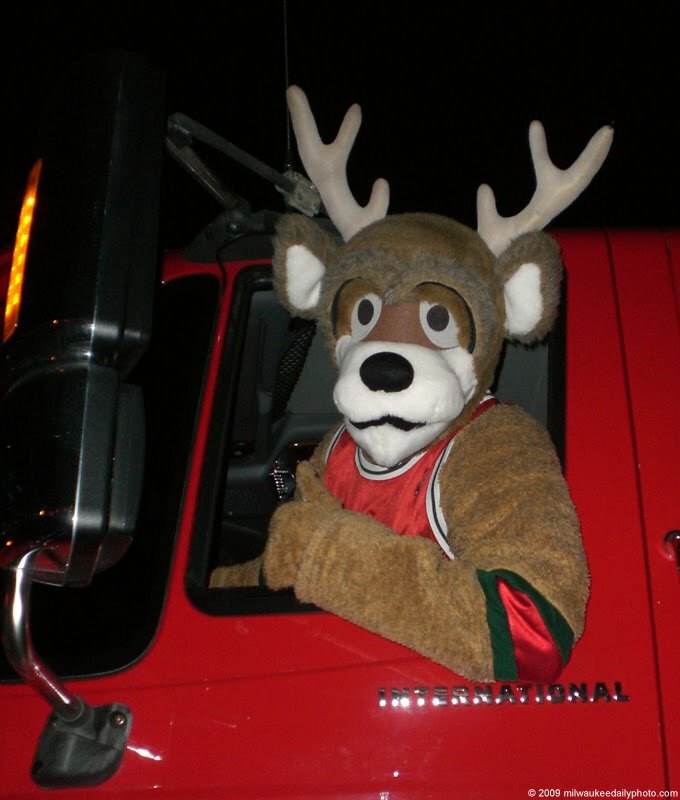 Since we already have one, we'll probably wind up delivering one to a food bank. 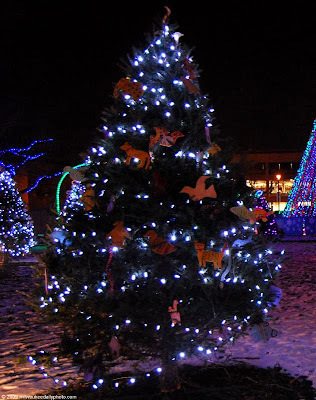 The Holiday Lights were lit this week around town, including the display of trees decorated by schoolchildren that are in Cathedral Square. 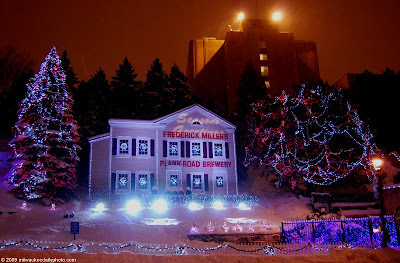 Don't get too excited - today's photo is from last year - we don't have any snow - yet. Today's photo is the opening green flag from the 2008 Craftsman Truck Series race at the Milwaukee Mile. 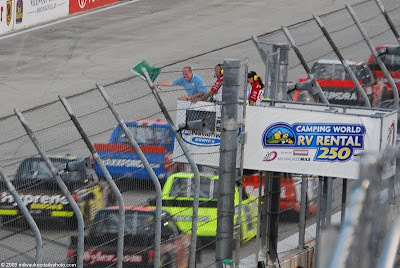 With the demise of the latest attempt to keep the track open, I wonder if we'll ever be able to see this sight again. As a kid growing up in the 70's and early 80's, I had a beer can collection. I don't know why... it was just the thing to do. 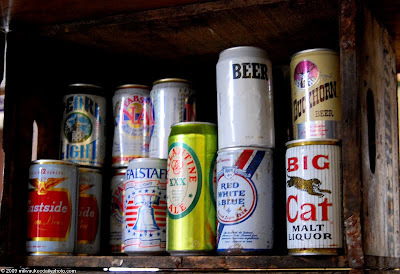 I recognize some of the labels in today's photo from those days, so I suspect that they're all from around that era. This collection and more can be seen in the gift shop at Best Place. 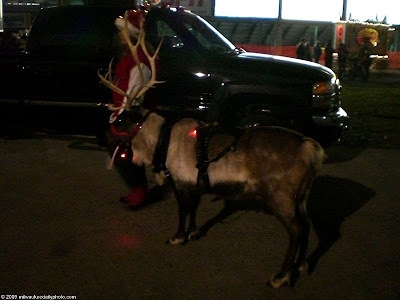 The side of the trailer read "Reindeer for Hire", and they sure did deliver. Three reindeer pulled a wheeled sled in the West Allis Christmas parade Tuesday night. 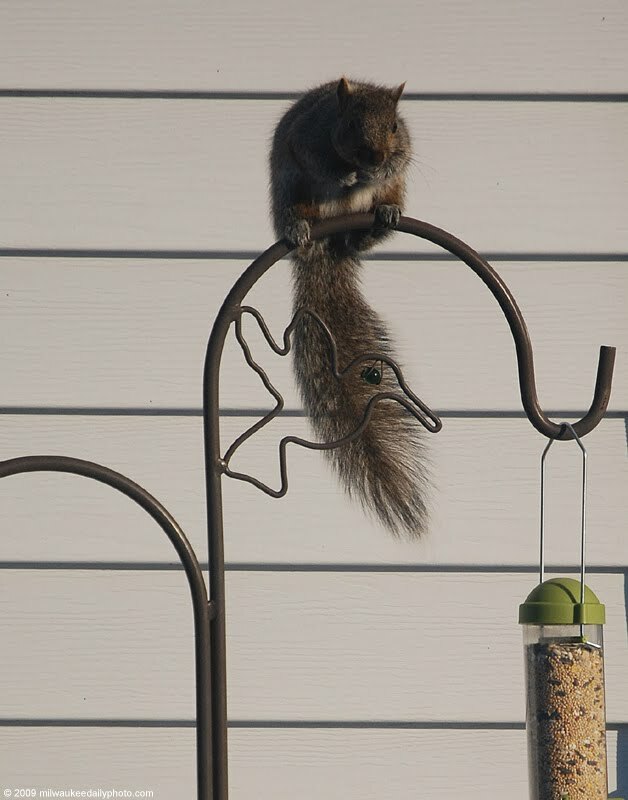 After filling the bird feeders, I knew it would not be long before the squirrels would come to visit. Their ability to balance on the top of the shepherd's crook in a stiff wind is interesting to watch. As the weather turns, thoughts of summer keep us warm. This spread of (mostly) fried foods on a picnic table at Summerfest gives us hope that winter will be short and we'll be able to do this again. 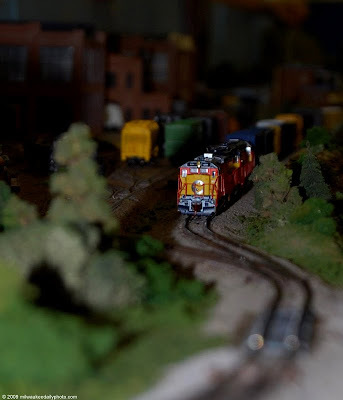 This weekend was Trainfest 2009, the annual model and small train show at the Wisconsin Expo Center. As always, there were many youngsters in attendance, as well as the young-at-heart. Sometime tomorrow, Mayor Barrett (foreground) is expected to announce his intent to run for Governor of our state. The rumors have been flying for a few weeks now, and it will be interesting to see how it all plays out. 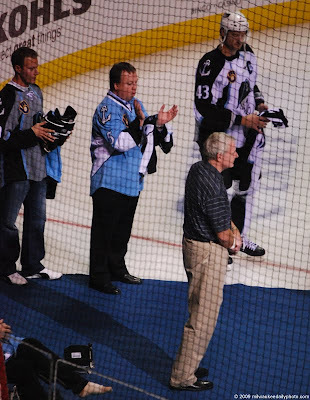 Today's photo was taken at the Admirals' home opener a couple weeks back, where he was honored for helping to break up a domestic dispute, and received some pretty serious injuries in the process. The 2009 edition of the Holiday Lights Festival and the lighting of the City/County Christmas Tree will be held this coming Thursday. 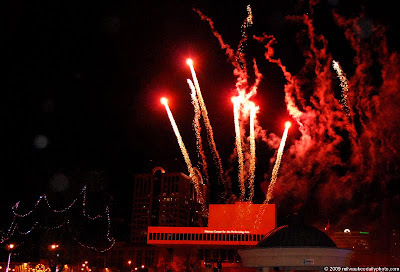 The celebration starts at 4:30pm at Red Arrow Park, and continues at Pere Marquette Park at 5:30. Today's photo is from last year's event. Tonight, we were at El Fuego (again), celebrating a birthday dinner with friends. 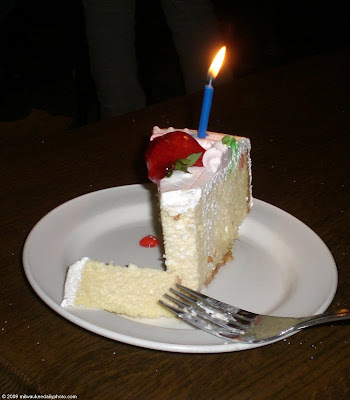 As part of the celebration, the waitstaff brought a piece of Tres Leches cake for the celebrant. It was moist and quite tasty. The minutes just before and just after sunrise and sunset offer great opportunities to capture the light at its finest. The problem is that those moments are fleeting. 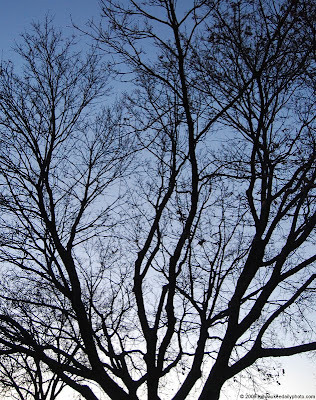 Today's photo is of the branches of a maple caught just before sunset. We don't always get the chance to thank our heroes. If you see a veteran tomorrow, be sure to acknowledge their service and express your gratitude. 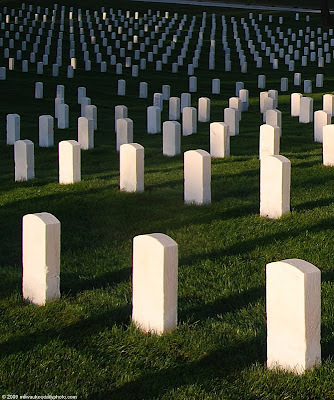 Today's photo is from Wood National Cemetery, near Miller Park. 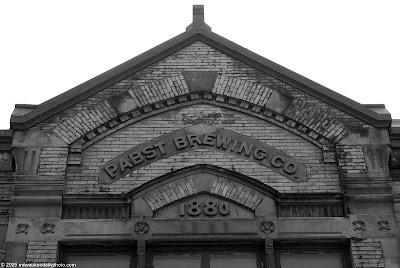 Recent news articles are reporting that Pabst Brewing is for sale again, this time by the charitable foundation that owns the company. The company is currently based in Illinois, and has only 30 employees, since they contract out for all their manufacturing (including some to Miller here in Milwaukee). 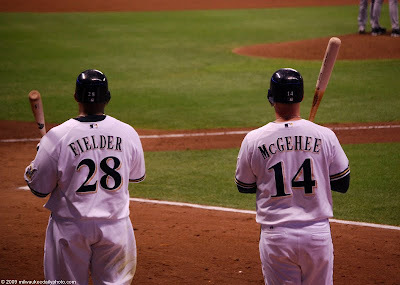 It would be great to have them back in Milwaukee - they could even move back into their old corporate offices, the subject of today's photo. 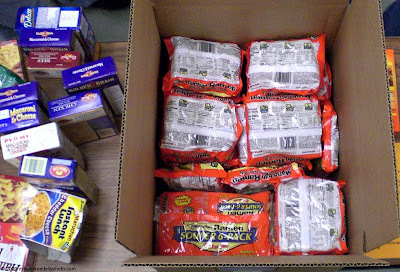 When we've gone to help sort food at the Hunger Task Force, one thing we've seen consistently is Ramen Noodles... LOTS of Ramen Noodles. Yes, they're cheap, and easy to donate. But have you ever read the nutritional information? 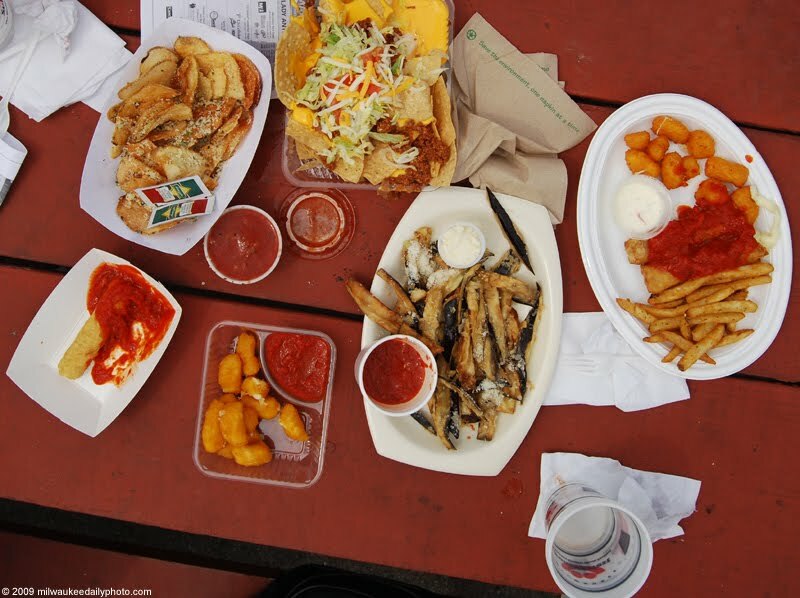 Bring a can of beans or vegetables as well, and you've got a much better-balanced diet. Until November 22, if you bring a non-perishable to the Milwaukee Art Museum, you can get two dollars off admission, including the special Warhol exhibit. 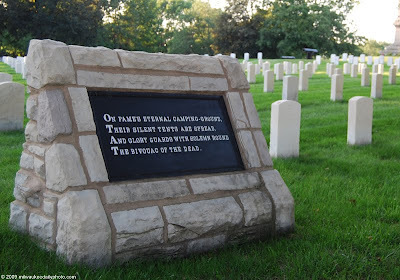 It is part of a poem by Theodore O'Hara, written to commemorate Kentucky troops killed in the Mexican war in 1847, and can be found in its entirety at Arlington National Cemetery. 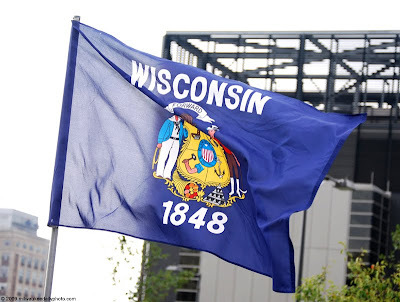 The Wisconsin state flag. Have a great weekend, and remember that there are many Veterans' Day observances going on... take time and attend, if you can! 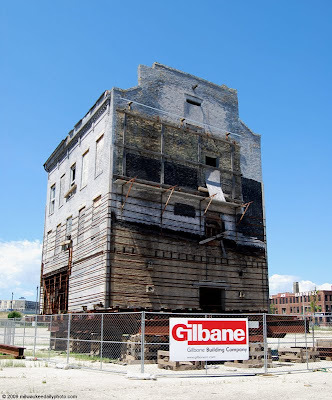 The Gipfel Union Brewery (featured previously here) has been ordered demolished by the city, since it's no longer safe. While saving it was perhaps a good idea, the building was probably in no condition to be repaired to a stable structure. 100 years ago today in a farm field near Beloit, Arthur Warner took flight in his Curtiss biplane, the first flight in the state. 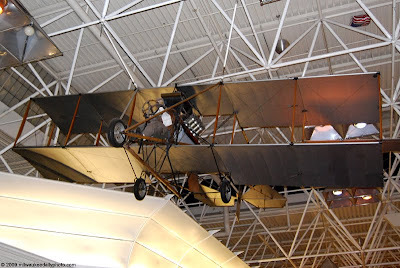 The plane in today's photo hangs from the ceiling in the main terminal at Mitchell International Airport, and serves as a reminder of the times when wings were made of wood, wire, and cloth. 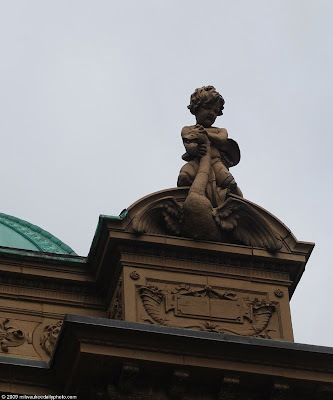 This sculpture sits atop the visitors entrance to the Pabst Mansion. This portion of the building was at one time a chapel in the building, which was last owned by the Archdiocese of Milwaukee as a residence for the archbishop. 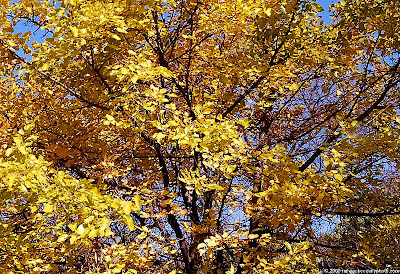 The recent rain and wind have stripped the leaves from most of the trees, but a few stalwarts have managed to keep their foliage. The change back to Standard Time has left us with little light in the evenings, and it's starting to get much cooler at night. Today's Photo is from the entryway at St. Josephat's Basilica. 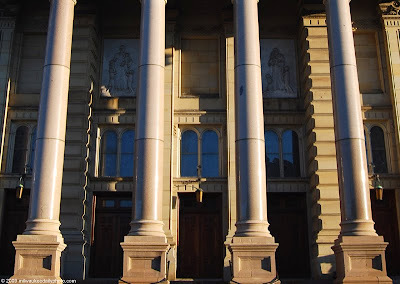 The doors themselves look tiny in comparison to the huge stone columns and the rest of the church.